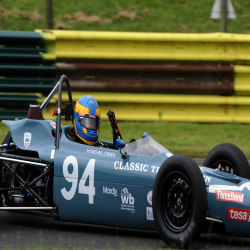 Classic Team Merlyn arrived at Croft in good Spirits after team drivers Geoff Underwood and Michael O’Brien both enjoyed successful weekend’s racing at the Silverstone Classic, the later taking a double win in the big Formula Ford 50 celebration. Friday played host to a regular test day where both drivers completed lots of laps and set up changes to put them in a good position for the qualifying and races during the weekend. As with all the races this season, the qualifying has been split into two groups due to the number of entries. CTM had a driver in both session and it would be Geoff Underwood who took to the track first to put in a strong qualifying, his best of the season! Michael bagged another pole position in his group but this would leave him second overall as favourable track conditions enabled group 1 to have a faster session. Geoff was a big feature in the weekend's racing, taking part in all four races and enjoying some very strong results and lap times, running close to the front on multiple occasions. Michael would drive in the two Championship races, securing a strong 2nd place in race 1 and another great win in race 2 of the weekend! Both drivers have come away from Croft driving brilliantly and looking to build on there strong pace and results at this weekends race at the Gold Cup, held at Oulton Park!